A few weeks ago, Neil Gaiman made a hilarious appearance on an episode of the Simpsons (pictured above, and as of this post, you can still watch it on Hulu). When Homer and his Ocean's 11-esque assembled crew decide to team up and write a Young Adult novel, Gaiman jumps in to help make it happen. Unfortunately, the publisher tries to alter the story, and the gang of would-be-novelists (and a multiple award winning one) plan a heist to get it back and put the original in stores. Quote of the episode? Gaiman exclaiming "I've heisted my way to the bestseller list once again. And the most brilliant part is... I don't even know how to read!" Well, either that or Homer hoping they remember to "put in enough steampunk. Whatever that is." Anyhow, the episode got me thinking about other awesome authors cameos I've caught on the Simpsons. Lisa being dismissed by Amy Tan, Alan Moore with rippling muscles, Michael Chabon and Jonathan Franzen getting into a fight... ah, so many brilliant moments. I've rounded up my Top 10 here (in no particular order), though there are certainly many more. If I missed a favorite of yours, leave it in the comments! 1. Amy Tan: The celebrated author of The Joy Luck Club makes an appearance in the 'Insane Clown Poppy' episode, speaking at the Springfield Festival of Books. Lisa tries to compliment Tan on her work, to which Tan hilariously responds "no, no, that’s not what I meant at all. I can’t believe how wrong you got it. Just sit down, I’m embarrassed for both of us." Stephen King also makes an appearance in this episode, cackling madly about a supposedly non-horror title he's hard at work on. 2. Thomas Pynchon: This notoriously reclusive author actually made TWO appearances on the Simpsons. He pops up in the episodes Diatribe of a Mad Housewife (clip above), in which Marge writes a romance novel and he "provides" a quote, and All's Fair in Oven War. 3. J.K. Rowling: I won't lie to you, Quirk fans. I didn't get into Harry Potter until fairly recently, when Broetry author Brian McGackin threatened not to speak to me until I read the entire series. I'm about halfway through Order of the Phoenix as of this posting, and thankfully, Brian and I are on speaking terms once again. As a result though, this is probably my favorite author appearance on the Simpsons. I rediscovered it while looking up author cameos, and thanks to Brian, I can finally appreciate how funny it is. 4. Michael Chabon & 5. Jonathan Franzen: When Lisa discovers Moe might actually have the heart of a poet, she combines all of his Post-It notes into a heart-wrenching poem and sends it off to a poetry magazine. Hailed as a masterpiece, Moe's poem gets him on the cover of the publication, and he's invited to literary conference in Vermont. It's here that we meet Michael Chabon, Jonathan Franzen, Tom Wolfe. and Gore Vidal, all invited guests at the convention. While all four of the authors are great on the show, Franzen and Chabon are hysterical. They get in heated fight, Franzen breaks a table over Chabon's head, Chabon accuses him of fighting like Anne Rice... Brad Jaegar has a nice play by play in pictures on his blog of the battle. Hilarious. You can watch the clip in Spanish here on YouTube. I choose to believe that the real Tom Clancy does indeed have a picture of a framed submarine above his desk. 7. Alan Moore, 8. Art Spieglman & 9. Daniel Clowes: In the episode Husbands & Knives, a new comic book shop opens across the street from Comic Book guy's establishment, bringing with it some serious guests. Alan Moore (Watchmen, V for Vendetta), Art Spieglman (Maus) and Daniel Clowes (Ghost World) make cameos in this episode, rocking huge muscles and the ability to fly. 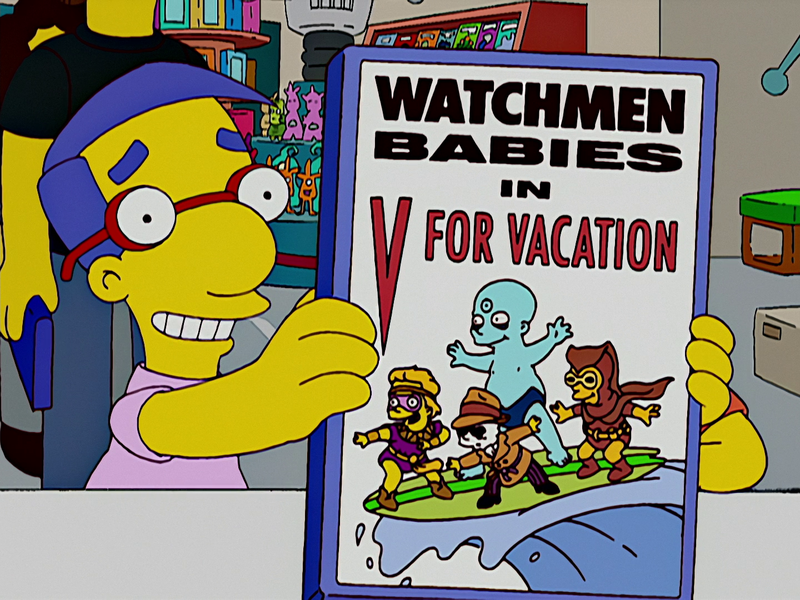 Arguably the best part of this episode is watching Milhouse hold up his copy of Watchmen Babies in V for Vacation. I would so buy that book. 10. Neil Gaiman: And last but not least, Neil Gaiman, who I already spoke about above. It is worth noting that unlike a lot of the other cameo appearances by authors, Gaiman is practically a supporting character through his episode. Well done, Neil. Who'd I miss? Leave your picks below!